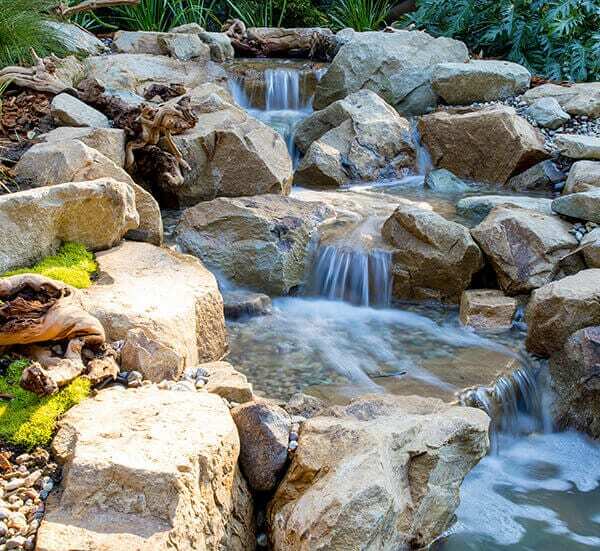 As a landscape contractor and designer, the pond that California Waterscapes installed at the Zakarian residence is not only professionally installed but it was artfully and aesthetically created. They took a dead area and made it come alive. I noticed that both Arthur and Caroline now sit out by the pond and just enjoy the area. You guys did a great job. This letter is to express how happy and delighted we are with the waterfall and pond that your company designed and built. Craig was our first contact with your company. He was very helpful and professional in putting together the pricing, initial design and layout of the project. The project was a large one and one that was not without a few minor problems. However, with the teamwork and the understanding of our needs, the obstacles were met and handled with speed and efficiency. The project leader Fernando, was on top of the entire project and always kept us informed of the daily goals and the future accomplishments in the coming days. His personality and professionalism made for a very comfortable relationships with us. He was always a phone call away to answer our questions and to calm our concerns. The design of the waterfall and the pond was way above our expectations. This was all due too Luis and his artistic eye for the project and the flow of the terrain and our vision. He put all of this together and came up with a masterpiece. Chuy, also had some very good suggestions. A project leader and artist can not pull this off without a well organized team. The team leader was Patrick. Patrick and the gentlemen that worked on our project were such hard workers, so nice and so polite. What can I say. . . our beautiful pond has changed our lives. I always wanted to have a babbling brook and I got so very much more. I must spend an hour a day by the pond. I was the one who wanted the water feature and yet my husband is enjoying it even more than I am . . . if that’s possible. We have coffee out there, and the first thing we do in the evening is go out and sit in our swing and enjoy the water. It’s just fantastic, we just love our pond! It’s changed our life. We literally stopped watching TV at night and sit out by the pond and talk. My husband was so excited about the new lights you put in our pond and how clear the pond is, he is now building a new fire pit, so we can spend winter nights next to the pond. We have recommended your company to our neighbors to build their pond. We would recommend you to anyone. I wanted to take a moment to tell you how pleased I am with my pond. As a caterer, I was interested in creating a particular atmosphere for my clients. You and your crew did an incredible job of creating a beautiful, tranquil, Zen garden. The installation was very fast and you were adaptable in overcoming some obstacles. The function of the pond is perfect and the water is clear. The paving stones accent the pond and added some warmth to my garden. My clients love it. I am very pleased with the design and installation of your company, in fact I have recommended you to a friend of mine. Thank you for our beautiful, incredible pond! We absolutely love it. Our friends and neighbors just love to come over and see our pond. We are enjoying it so much. We have been restoring a 1925 Spanish home for about six years now and we still have a lot to do, but our pond is quite amazing. We love the sound of the water which we can hear from our bedroom window. We are so pleased with your customer service. In all the last six years we have dealt with a lot of contractors and you and our tile man are the only one we will recommend. We have actually given out your business cards. I just wanted to tell you how happy I am with my pond. I have always wanted a pond and it’s much more beautiful than I expected it to be. It’s wonderful. Your designer, Peter, was very pleasant and helpful in explaining how it worked and did a nice sketch of how it would look. The men worked so hard, without stopping. I think one of them was the owner’s son and he was so nice. They were well organized and they arranged the stones and plants so artistically. . . they are perfect. I love to sit by the pond when it’s quiet and cool and really enjoy it. The fish are fun to watch and they never complain about anything. I’m so happy, thank you. Thank you for our beautiful pond. We absolutely love it and it added so much to our yard. It’s fantastic! My husband and I really enjoy having breakfast out there. We sit by the stream and watch the birds and just relax. Your staff is quite friendly and accommodating. Everyone was so nice, from the designer to the installation crew. Ken came out and brought some new plants and planted them so artistically. Now it looks so natural, which is just what we were looking for. Thank you for your professionalism. I will be happy to recommend your company to my friends. We are very pleased with the pond. It turned out so much better than we imagined. There was no pressure and it cost exactly what you said it would. It actually cost less than one would expect. Our friends’ comment was ‘It looks like it grew there’. I noticed during the installation that there was no hurry to leave until it was really right. Your company is easy to work with, friendly, and dependable. Everyone was very nice and accommodating.